THIS SHOW REPRESENTS A SCHEDULE CHANGE. Imani Cezanne (bio below) has had to cancel her trip to New England. Filling in will be April Ranger visiting from New York City. 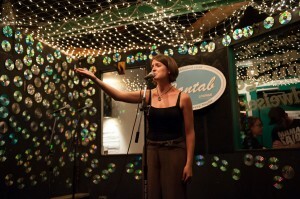 April Ranger performs on the upstairs stage at the Cantab Lounge in 2011. Photo by Marshall Goff. April Ranger is a poet, playwright and performer. A three-time member of Boston Cantab’s National Poetry Slam team, April has toured extensively across the Unites States. Her work has appeared in several publications, including Muzzle Magazine, apt, and the anthology Courage: Daring Poems for Gutsy Girls (Write Bloody Publishing, 2014.) April directed the premiere of her short play, Civilized Rituals, for the 2013 Dorchester Fringe Festival. She grew up in Maine and currently lives in Brooklyn, New York. Imani Cezanne, 2014 Women of the World Poetry Slam runner-up. Photo by Holly Haines. Born and raised in San Diego, Imani Cezanne is a passionate poet, workshop facilitator, community organizer and slam coach. 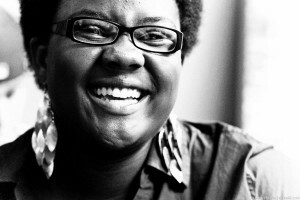 She just recently returned home from taking second place at the Women of the World Poetry Slam in Austin. In the past four years Imani has been on four National Poetry Slam teams (San Diego, Oakland and Hollywood’s Da Poetry Lounge), three of which placed in the top six at the National Poetry Slam. Last season, along with two of her team members, she was invited to perform on the TV One network’s Verses and Flow, a cable television show dedicated to showcasing performance poets from around the country– all while obtaining a bachelor’s degree in Africana Studies from San Francisco State University. The Love. Always. tour took her on a 35-show nationwide tour through New York, Colorado, California and more, and now she’s swinging back around to take a few more stops in New England for our listening pleasure.